The West End Theatre was situated on the corner of Withington Road and Dudley Road, in the Whalley Range district of Manchester. The Theatre opened with the film 'All Quiet on the Western Front' on Monday the 1st of December 1930. The Theatre was designed by the Manchester Architect John Knight F.R.I.B.A., and its auditorium, which was constructed on two levels, stalls and one circle, could accommodate 2,000 people in some comfort. The Theatre was primarily built as a Cinema and had a projection box behind the rear of the circle, this was equipped with two Western Electric Kalee Sound projectors. The Theatre was also equipped with a stage for live variety productions, and had four dressing rooms for artistes. A large cafe for the Theatre's patrons was situated over the main entrance. 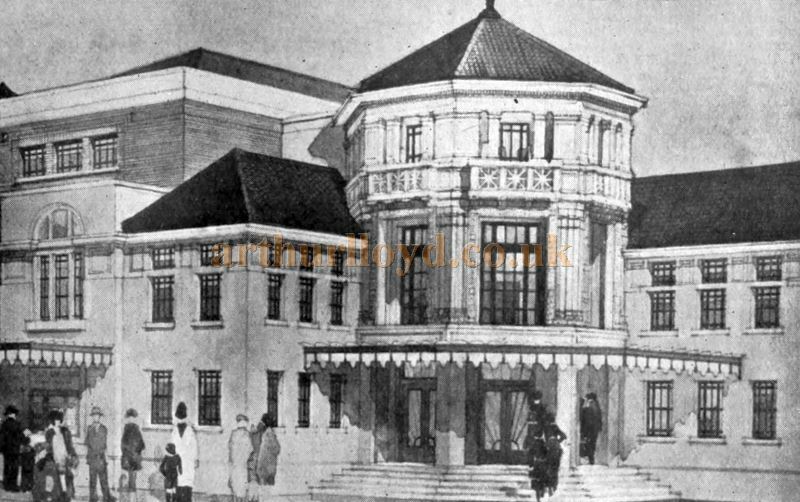 The Theatre's General Manager on its opening was E. Linsdell, and its proprietors were T. Royle and J. T. Wells. Manchester's claim to some of the finest theatres in the North of England is strengthened by the completion of the West End Cinema, Whalley Range, which opened on Monday with "All Quiet on the Western Front." The proprietors of the new theatre are T. Royle and J. T. Wells, two well-known Manchester exhibitors. The general manager is E. Linsdell. Built to plans prepared by John Knight, F.R.I.B.A., Manchester, the West End Cinema is an imposing structure at the corner of Withington Road and Dudley Road, with facades distinguished by fine simplicity and quiet strength. It is a plain businesslike job, unrelieved by any touches of grotesquerie or "showiness," though it has none the less a commanding presence. The entrance block has been executed in cream glazed terra-cotta, the details of which are picked out at night by a battery of floodlights. Marble steps lead to the main entrance hall, which is octagonal in shape (about 27 ft. across flats) and has a flooring of black and white marble. The walls are lined with tiles in pastel shades of grey, relieved with touches of gold. In the centre of the entrance hall is the pay kiosk, equipped with Automaticket machines, whilst archways to the rear and on one side lead to the marble staircase to the balcony and to the auditorium lounge respectively. The latter is a comfortable room, about 38 by 17 ft., tastefully furnished, the walls being lined to dado height with figured walnut. Seating is provided in the theatre for just over 2,000 persons - about 1,400 in the stalls and the remainder in the balcony. In the auditorium, which measures 140 ft. long by 76 ft. 6 in. wide, the floor is entirely covered with super Wilton patterned carpet, and this is also laid in the lounge and balcony. All the seats are of inlaid mahogany, upholstered in flame coloured plush, those in the stalls being 2 ft. 9 in. from back to back and those in the balcony 3 ft. 3 in., thus allowing plenty of leg-room. There has been a complete breakaway from the formal and atmospheric in the decoration of the auditorium, where a combination of bright colourings, delicate fibrous plaster work and subtle lighting effects make a nicely balanced picture of easy comfort. Up to dado height the walls are tiled in grey. The side walls are relieved with sun-ray panels over ornamental plaster bowls, which conceal lights focussed on the raised plaster ribs, gilded to represent rays. The colour scheme depends on the use of warm tints, contrasted against a charming blend of turquoise blue and gold leaf. The large decorative proscenium panels are relieved by ornamental grilles finished in gold and overlook balconets. The arch of the proscenium is coved and the surface reeded and picked out in gold. Thus the concealed lighting in the outer and inner extremities of the cove are reflected into the auditorium. A stage and four dressing rooms are provided for the presentation of variety acts. There are three stage curtains, including the Holophane curtain, the front one being in gold mohair. All of them are controlled from the operating box. Over the frontage on the first floor is the café, which extends under the balcony to a depth of nearly 21 ft. and accommodates about 40 tables. Here the walls are lined to a height of 8 ft. with figured walnut. In the well-equipped kitchen a Frigidaire has been installed. Retiring rooms for both sexes are located on this floor. The operating suite of rooms, behind the rear balcony on the third floor, houses two Kalee machines adapted to Western Electric talking picture mechanisms, with Hahn. Goerz high intensity arcs. Crompton Parkinson generators are installed. Special attention has been given to the lighting arrangements both inside and outside the theatre. On the main ceiling there are eight 5-ft. 3-in. tier fittings, and under the balcony four 2-ft. 6-in. fittings of similar design. 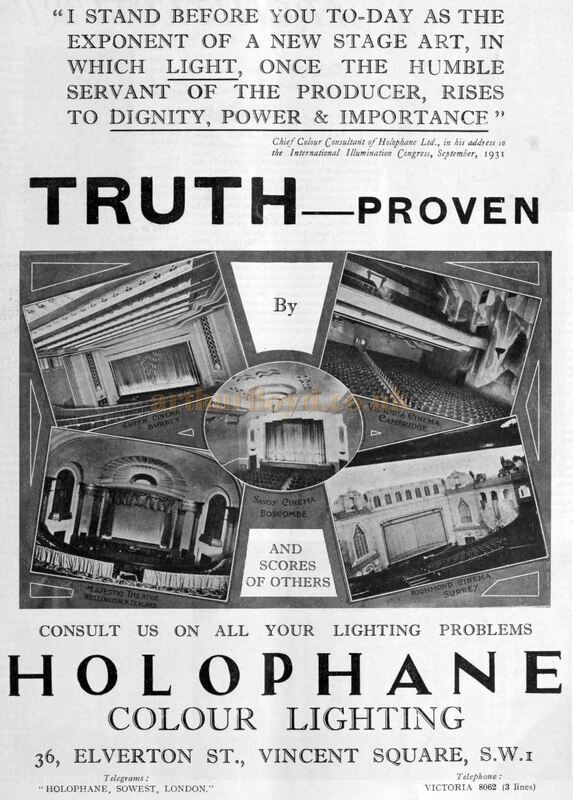 The front of the auditorium has Holophane lighting (See advertisement below), some of the lamps being concealed in the balconet under the proscenium panels. In the mouldings of the proscenium front there are 400 lamps, whilst a further 250 lamps are used for the stage floats and 550 lamps for the concealed lighting about the hall. Demi-coupe wall brackets are fitted. Above - An Advertisement for Holophane Colour Lighting - From The Bioscope, September 16th, 1931. One distinctive feature is the exterior lighting. The cinema boundary is marked by 16 three-light lamp standards, linked up with festoons. Between these standards at the main and side entrances respectively have been erected two large trellis work archways, which carry a total of 800 lamps. Altogether 2,500 lamps are used for the exterior illumination, in addition to which are six powerful floodlights focused on the terra-cotta work to emphasise the architectural beauty of the building. =The three-light standards, incidentally, enclose the parking ground for 150 cars at the side of the cinema. Altogether the lighting load, exclusive of projector lamps, is 300 k.w. For heating the theatre, radiators are-fitted in recesses in the auditorium walls. The Above article on the West End Theatre, Manchester, was first published in 'The Bioscope' December 3rd 1930. In August 1937 the Theatre was taken over by Odeon Theatres Ltd and renamed The Odeon, and ran as such until it was closed on the 23rd of December 1961 to be converted for Bingo use under the Top Rank Bingo name. Later operated by, and renamed, Star Bingo, the Theatre was finally closed by EMI in 1980 and demolished in 1986 to make way for a Housing Development called Crystal House, see image below. 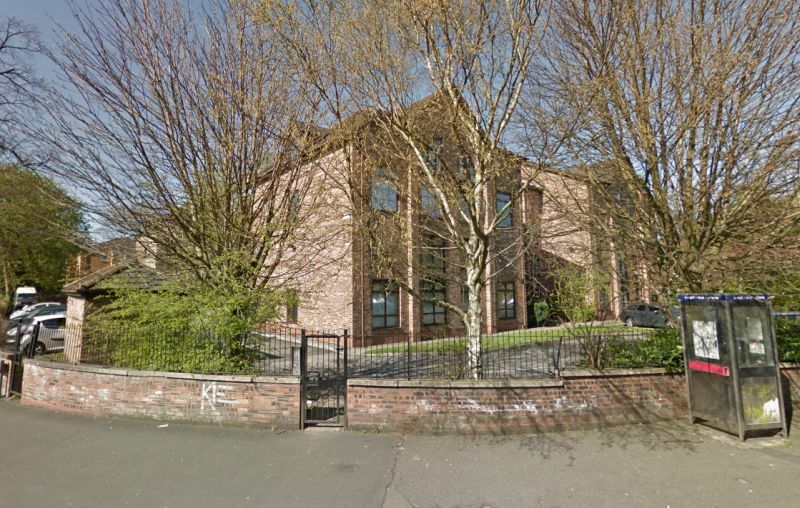 Above - A Google StreetView Image of Crystal House Whalley Range, Manchester, which was built on the site of the former West End Theatre / Odeon Cinema in 1986 - Click to Interact.